Yellow-billed river terns are a rare species of birds that distribute in India, Myanmar, Thailand and China. For this type of birds, breeding is not easy especially when they build nests on sandbars. In Yingjiang County, Dehong Dai and Jingpo Autonomous Prefecture, southwest China�s Yunnan province, this is no exception. 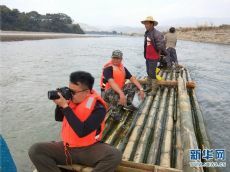 �We assigned three persons to carry out all-weather monitoring on the water level and make sure no human beings or animals enter the safety range around the birds� nests,� said Zuo Changsheng, deputy director of Yingjiang Branch of Yunnan Tongbiguan Provincial-level Natural Reserve.